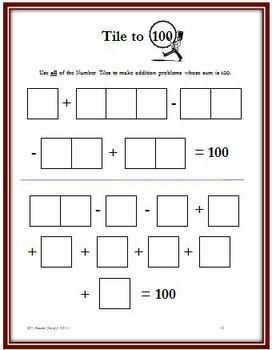 Number Tiles is a 26 page booklet containing 15 different math problem solving activities for grades 5-8 that range from addition and multiplication, to primes and composites, to exponent problems, to using the divisibility rules. Since the students do not write in the book, the pages can be copied and laminated so that they can be used from year to year. 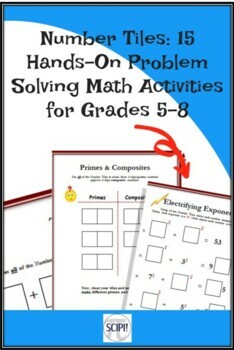 These activities may be placed at a table for math practice. They are also a perfect resource for those students who finish an assignment or test early. 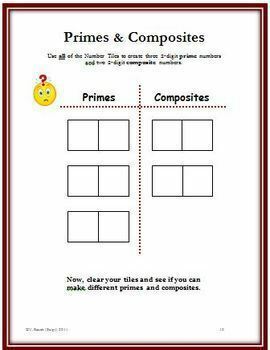 Use these activities to reteach a concept to a small group as well as to introduce a new mathematical concept to the whole class. Students solve the Number Tile Math Activities by arranging ten number tiles, numbered 0-9. The number tiles can be made from construction paper, cardboard, or square colored tiles that are purchased. (How to make the number tiles as well as storage ideas is included in the handout.) 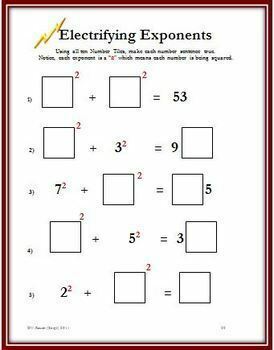 Each problem is given on a single page, and each activity varies in difficulty which is suitable for any diverse classroom. Since the students have the freedom to move the tiles around, they are more engaged and more willing to try multiple methods to find the solution. Some of the problems will have just one solution while others have several solutions. Download the preview page to see three sample activities. These activities are very suitable for the visual and/or kinesthetic learner.